While I am not old enough to vote, I was able to co-sponsor legislation as part of the San Diego Hunger Advocacy Network to help financially struggling military families in California. Co-sponsoring legislation was exciting, frustrating, and ultimately inspiring process thad me constantly humming School House Rock’s “I’m Just A Bill”. Excitement at the possibility of helping military personnel put food on the table was my first phase in this process. Several years ago my older sister filmed active military families in line for hours to get free food from charities for a student documentary. While I was only 12, that discovery set me on path to create a national charity and then four years later to a Senator’s office making a pitch for his “yes” vote to pass my “No Hunger For Heroes” Bill. My little teen non-profit partners with the heavy weights like Feeding America, San Diego Hunger Coalition, and North County Food Bank who actually treat me like part of their team and provide us amazing opportunities to make a difference. 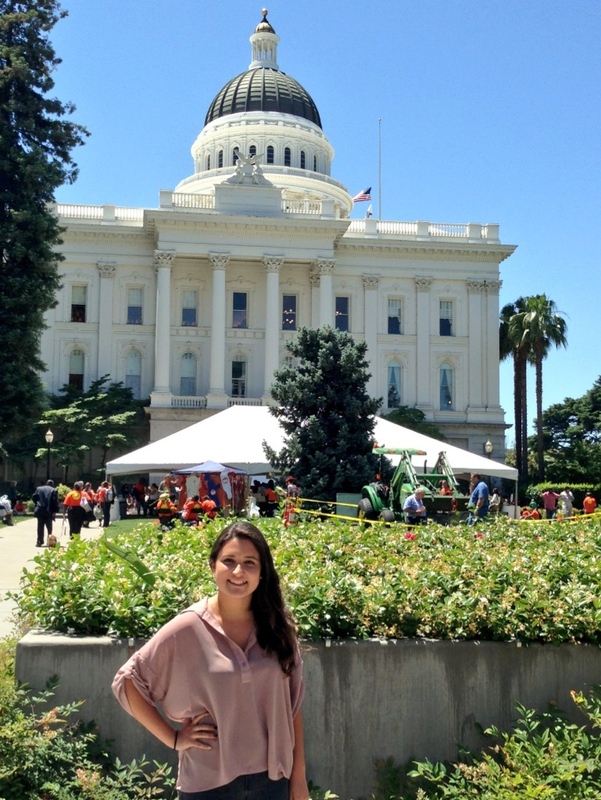 Every year we fly to Sacramento to lobby law makers on Hunger Action Day, but this time was extra special because we had legislation pending. Having worked on passing “Zero Waste” legislation previously, I was familiar with some of the aspects of turning an idea into a law, but co-sponsoring legislation is very different. That bill is your little guy and you want don’t want to see him sitting on the steps of the Capitol Building singing sadly. The legislative process is very complicated; it generates a lot of paperwork, emails, and adults talking in acronyms. There are so many procedures and so many bills, that the very law makers who author them don’t always keep them straight. Seriously, I was in a meeting with a State Senator who didn’t remember the bill he was just asked about was one of his. One of the big hurdles for my bill was getting past the Appropriations Committee, where a few key elected leaders debate new legislation especially about cost. As our bill had a cost associated with helping active military families, who struggle put food on the table, “concessions” had to be made. Now that infuriated me, because there are certain priorities I think we need to have as a nation and making sure our troops can adequately feed their families is one of them. We ask 1% of our population to protect the other 99% of us, move them around a bunch, don’t pay them much, and then deploy them over and over again to places where they get shot at. Even in tough economic times we need to have a safety net for these Americans. While upset that my bill was trimmed, it could still help military families; especially soon to be veterans who can’t re-enlist due to the troop cut backs. With procedure deadlines looming our little guy made it out of the Appropriations Committee and went to the Senate floor for a vote. The California Senate voted unanimously for our bill and so too did the State Assembly. The Governor signed our “No Hunger For Heroes” bill a few weeks later and our little guy finally got that shinny gold seal, fancy paper, and became law. How are laws are made is complicated, but it works. It is inspiring to think that in our country even if you aren’t old enough to vote, you can be a part of the legislative process. My experience also made me painfully aware that the hungry and the environment don’t have the big teams of high powered lobbyists. Those types of legislative issues fall to people like us. In order to ensure our government is “Of the people, for the people”, we need to get past the frustrations of politics and actively participate. Without us, law makers only need to remember the bills proposed by the guys in the expensive suits, not the ones lobbied for by a girl with braces.